Notes: Set of two small (22x44cm) promotional posters, issued in a tube. A matched set (one is black/silver, the other silver/black) printed on very thin weight paper, using the FACT 10 graphics. The "+4" refers to FAC 5, FAC 6, FAC 11 and FAC 12. 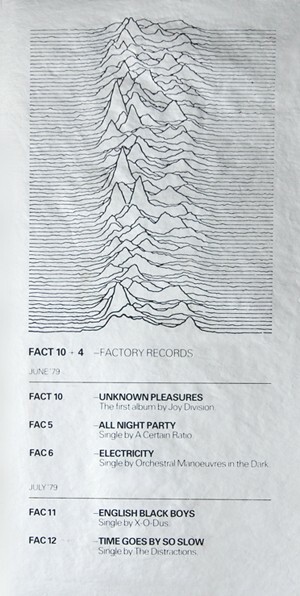 Both posters [text]: "FACT 10 + 4 FACTORY RECORDS, June 79, FACT 10 UNKNOWN PLEASURES, The first album by JOY DIVISION. FAC 6 ELECTRICITY, Single by ORCHESTRAL MANOEUVRES IN THE DARK., July79, FAC 11 ENGLISH BLACK BOYS, Single by X-O-Dus, FAC 12 TIME GOES BY SO SLOW, Single by THE DISTRACTIONS."